It is said that Tibrogargan, the father, and Beerwah, the mother, had many children. 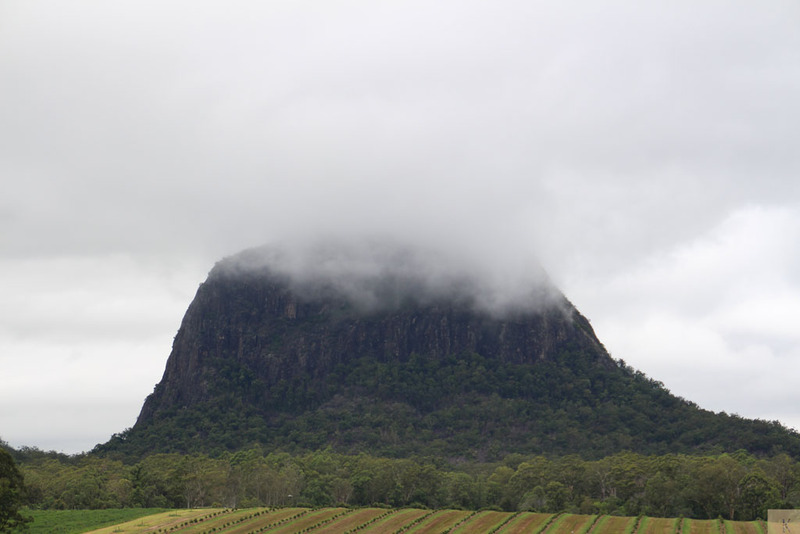 Coonowrin the eldest, Beerburrum, the Tunbubudla twins, the Coochin twins, Ngungun, Tibberoowuccum, Miketebumulgrai, and Saddleback. There was Round who was fat and small and Wildhorse who was always paddling in the sea. One day, Tibrogargan was gazing out to sea and noticed a great rising of the waters. Hurrying off to gather his younger children, in order to flee to the safety of the mountains in the west, he called out to Coonowrin to help his mother Beerwah, who was again with child. Looking back to see how Coonowrin was assisting Beerwah, Tibrogargan was greatly angered to see him running off alone. He pursued Coonowrin and, raising his club, struck the latter such a mighty blow that it dislodged Coonowrin’s neck, and he has never been able to straighten it since. When the floods had subsided and the family returned to the plains, the other children teased Coonowrin about his crooked neck. Feeling ashamed, Coonowrin went over to Tibrogargan and asked for his forgiveness, but filled with shame at his son’s cowardice, Tibrogargan could do nothing but weep copious tears, which, trickling along the ground, formed a stream that flowed into the sea. Then Coonowrin went to his brothers and sisters, but they also wept at the shame of their brother’s cowardice. The lamentations of Coonowrin’s parents and of his brothers and sisters at his disgrace explain the presence of the numerous small streams of the area. Tibrogargan then called to Coonowrin, asking him why he had deserted his mother. Coonowrin replied that as Beerwah was the biggest of them all she should be able to take care of herself. He did not know that she was again pregnant, which was the reason for her great size. Then Tibrogargan turned his back on his son and vowed that he would never look at him again. Yesterday was drizzly so off we set for a Sunday drive on Saturday. Leaving Woody Point we drove out to Dayboro, over Mt Mee, out to Woodford, up to Maleny and stopped off at the Glasshouse Mountains on our way home. This entry was posted in Australia, Nature, Photography and tagged Australia, Glasshouse Mountains, Queensland, Tibrogargan. Bookmark the permalink. It is a great story but the fact that there was no forgiveness is a shame. I have always found the area beautiful, yet haunting. Perhaps it is the unresolved anger of the father and the siblings? I agree the area does have a haunting feel to it. Funny you should say that. I noticed that despite the number of other people at the look-outs, everyone was very quiet, even whispering. I didn’t know the story of the Glasshouse Mountains. Thank you for sharing. I really liked it. My pleasure Suz 🙂 Thanks for calling in. Gorgeous photos. I love this area. I think I need another visit. Very interesting legend and such a beautiful place…. Amazing shots, full of atmosphere ! Is that a tale from the Dreamtime? That’s another beautiful part of our amazing country! One day there was a terrible fire in a forest and all the animals in the forest fled to the bank of the river, jumped in and swam to safety. A beautiful white horse raced to the bank and was about to jump into the river and swim to safety when it heard a squeaky little voice, down at its hooves. So the white horse took the scorpion on its back, jumped into the river and began to swim to safety. In the middle of the river, the scorpion suddenly stung the horse. Now they would both die. Great shot of the mountain topped by clouds.